Would you really put a price on your children? If they just to happened to be Jewish, then yeah, Mel wouldn’t think twice about doing so! Self-made millionaire Tom Mullen (Mel Gibson) seemingly has all that a man could ask for, and then some. He’s got the loving wife (Rene Russo), he’s got the lovable kid (Brawley Nolte), and the job that pays well, and will continue to do so, long after he’s dead. However, all of that happiness and sunshine goes away once Tom’s son is nabbed by a bunch of kidnappers who are demanding $2 million. Tom feels like he should pay it, but with the FBI in on the case as well, he realizes that if he does pay it, he runs the risk of never, ever seeing his kid again. Then again, if he doesn’t pay it, he runs the same risk as well, but with more of a cloud hanging over his head. What to do, what to do? You can only do so much and so little with ransom movies, which makes perfect sense as to why this flick felt like nothing more than a daytime soap-opera, with the idea of a kidnapping being the one aspect of the story to hold it down. In order for a flick to work like this, it has to be boiling and simmering with tension, as if the story itself and the characters that inhabit could literally go anywhere, at any time, just at the drop of a hat. But Ron Howard, as skilled of a director as he may be with most that he does, doesn’t quite have the skill to where he can take a simple premise like this, shoot it longer than 2 hours, and still keep everybody on the edge of their seats. That tension and suspense comes around near the 2-hour-mark, but everything else leading up to it feels like a slow-burner, without any real places to go. The places and areas that it does take a detour in, only feel like sad excuses for Howard to show everybody that this isn’t your typical, kidnapping flick. No siree, this one has more meaning and more of a point behind it. How? Well, because at one point, without giving too much away, Tom actually goes on a news station, gets in front of the camera, and puts a bounty on the kidnapper’s heads, stating that whoever finds these killers and his sons, will get double the amount of the ransom price he was originally proposed. This is one of the very rare smart ideas that I’m glad to see Howard take and it went on well for awhile, because you have to think about the media, and how much they love to twist the actual pain and agony that real families face, and take it in as their own story, made to be read and enjoyed by millions all over the globe. That’s what the media gives us and I could tell that’s the angle that Howard was trying to take with this material. Then, well, it all crashed and burned, going right back to where it started from: A soapy melodrama. And I hate to say it, but “soapy melodrama” isn’t exactly the right ingredient for a suspenseful, pore-sweating movie. Howard definitely tries to milk as much out as he can with this simple premise, but it to almost no avail. There’s no real point behind the kidnapping, the reasoning for doing so, or why this story is meant to be told. Which would have been fine, had the movie been a slam-bang, action-thriller that wasn’t asking us to use our brains too much or too often with the material, but those weren’t the types of waves I was receiving from Howard and co. Something felt like Howard was trying to reach for more than this material proposed, but ultimately failed at doing so. Meaning that instead of actually giving us something to chew and discuss on the way home, he just gives us a movie that’s in your head, and out of it a near-2 hours later. 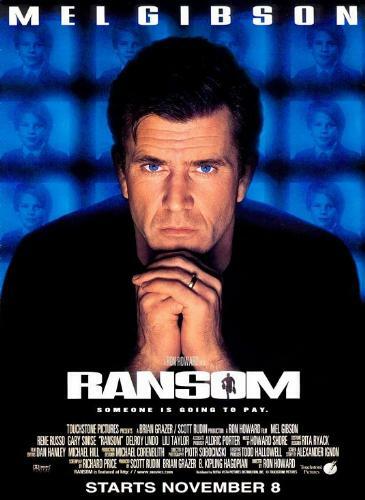 Not so bad if you can make your movie the most entertaining thing out there, but Ransom is not that type of movie. It may have some spills, chills, and thrills, but not much else boiling underneath the surface other than two pissed-off people. Would have been awesome if his character was a Lieutenant…..and named Dan…. Speaking of those said, two pissed-off people, they’re actually played very well by both Mel Gibson and Gary Sinise, respectively. Gibson is a good actor with these types of roles because despite him seeming like a bit of a freakin’ nut behind the scenes, you can still that there’s an ounce of heart and humanity to the guy, and it shows every time he takes a dramatic role like this. Obviously he doesn’t get these types of roles coming his way anymore, but when he can make a role that seems to go totally against his bad-boy, hard-edged image, then I’m always able to welcome it with arms wide open. I’ll just have to let him know that I’m not Jewish before he approaches me. Then we have Gary Sinise as the head-kidnapper who, despite being brought to our attention within the first 20 minutes, actually plays-up the psychotic-streak of this dude very well, actually making me believe that somebody so nutty and odd would actually go so far as to kidnap some millionaire’s son, just for the sake of fortune. That is until Sinise goes a bit overboard with this character, and has it come off more as a self-parody, rather than an actual character that you could believe handling himself in this type of situation, had it ever presented itself in front of him any other time. Together, they’re good because you never know who’s smarter than the other, but you know that their paths are going to eventually cross and when they do, all hell will break loose. It sort of does, but not in the way that you expect and I sort of liked that approach that Howard ended up taking. He goes for the over-the-top theatrics a bit by the end, but still keeps it grounded and humane enough to where you see these characters for all that they are, as random as they sometimes may be. Consensus: Everything about Ransom should spark and sizzle with tension, but Ron Howard can’t seem to get it up and going, despite a wonderful central performance from Mel Gibson, showing us more power and depth to a man that’s thrown against his will and all that he knows with the world. Hey, it’s all good. You don’t need to know everything, and that’s all fine and dandy. This is actually my favorite kidnap movie of all time. I think it’s awesome and I still watch it today and enjoy the hell out of it. I couldn’t quite get into it as much. However, it does have its moments. If you read my braveheart review then you’ll know that i’mm sucker for Mel Gibson movies :]. Haven’t watched this in years. I remember being a fun, but not great movie. Nice review. Thanks! It was alright, to say the least. I haven’t watched this in many years, but I remember it fondly. I found it very entertaining and filled with tension. Next to Braveheart, it might be my favorite Mel Gibson flick (including acting and directing gigs). That being said, I do see why you are being critical. It’s far from being perfect and it definitely has some dull moments and a bit of overacting towards the end. Those were my main problems with it, and after awhile, they began to just takeover. Thanks! Still rate this. One of Gibson’s best in my opinion. Strong review. Thanks! Not mine, but I see where you’d be coming from. Awesome timing for such a review, Prisoners opened last weekend and Rush opens this weekend. Definately a late 90’s drama / thriller worth checking out. Yeah, it does fit in pretty damn well. Thanks!